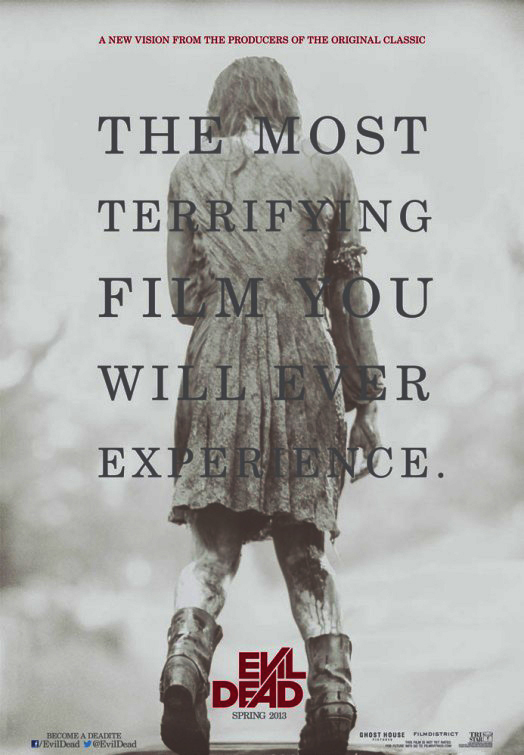 Evil Dead is a horror film that means business. After a brief prologue set in the past, the film wastes no time diving headfirst into pure, unadulterated horror. This reboot/remake takes the premise of Sam Raimi’s 1981 original film and kicks it up several notches. Once again, five friends are getting together for a weekend vacation in an old cabin in the woods. David (Shiloh Fernandez), Eric (Lou Taylor Pucci), Olivia (Jessica Lucas) and Natalie (Elizabeth Blackmore) have arranged this little trip as an effort to help Mia (Jane Levy) kick her drug addiction. Within minutes of arriving, they discover a hidden door on the floor of one of the bedrooms. Downstairs in this room are dead, rotting cats hanging from the ceiling and bound in barbed wire. There’s also a burned corpse. Oh, and a book known as the Naturom Demonto. You may have heard of it. Eric, ever so foolish, reads a short passage from this book aloud, awakening an evil supernatural force that begins haunting Mia. It doesn’t take long for the evil to spread to others in the group, causing a wild, bloody and gory affair. Oh, the gore. This film is not for the weak of heart. Skin is pulled in unfathomable directions, limbs are tossed aside like cigarette butts, and blood sprays everywhere. I usually have a strong stomach for this type of stuff, but I had to look away on more than one occasion. This is a gruesome, violent movie, and it’s bound to disgust those not suited to this style of horror. For fans of the genre, though, Evil Dead is a real treat. Despite lacking a strong central figure like the original’s Bruce Campbell, the cast is solid enough to make the film work. None of the performances are exceptional, but Jane Levy does stand out with her well-played transitions from evil to innocent. The real highlights in Evil Dead come from the makeup and special effects. The film is essentially CGI-free, and it is all the better for it. The attention to detail with the blood and gore is a thing of sick, sick beauty. Again, I cannot stress enough that this is not for the weak of heart. Evil Dead is a rare remake that gets it right. It’s extremely doubtful that it will obtain the same type of cult following that Sam Raimi’s film has achieved over the years, but it’s still strong enough to stand on its own. For that alone, Evil Dead can be considered a success. Sorry Eric, no interest in this one whatsoever but I did vote on your poll. Tough one this time but I went w/ Raiders and Blade Runner. Hah, yeah you would not enjoy this one at all, Ruth. I read somewhere that over 50,000 gallons of blood were used for one scene alone. It’s crazy. Good review Eric. Checked this one out with an open mind, and just didn’t care for it. Being a fan of the original, it was hard to get by how much promise was left standing here. I am a fan of the original as well, but I like the direction this one took. It’s definitely not for everyone though. Fine review, Eric. I enjoyed this. Some nice homages and fun updates to the original, with a real star turn by Jane Levy as Mia. That said, I can’t give it anywhere near a ‘A+’ as some have. It’s a very solid remake that I’d still recommend, but I saw ‘The Evil Dead’ in ’83 and that kinda spoiled me ;-). I think that’s a fair assessment, Michael. I’ll always be partial to the original as well, but you’re right in that this had some pretty cool homages and fun updates. I honestly wasn’t expecting too much, but this really delivered for me. I love all the Evil Dead films and this one was exactly what I was looking for. It is gruesome, gory, frightening and fun. Just came by from Fogs link bomb. I’ll try to make it back. Oh cool, thanks for stopping by, Richard! I was worried my comment would get lost in the shuffle there. 😀 Great to hear you enjoyed this remake as well. Do want to check this out, though I’ve not seen the original. Don’t mind the gore so much. After Cabin in the Woods, looking for another solid horror film. So few in the genre. Nnnnnnnnnice. 😀 I know how good a score an 8/10 is around these parts, and it is GREAT to see you on the Evil Dead bandwagon. I was blown away by this movie. I really, really loved it. You’re right, its mainly a gore hound’s treat (not that I consider myself one, actually), but I think all fans of horror should love it. Nice one Eric. Glad to see you enjoyed it! Thanks man, thought you might be happy to see this. 🙂 Honestly, out of the three films I watched that day, this is the one I had lowest expectations for. Turns out it was the best by far. Not sure what to make of all the hate for it. This is one of the better modern horror films I have seen in a while, “remake” label be damned. I’m with ya. I found this to be a hoot on its own merits. A few problems at the end but that’s about it! Solid review! Thanks, man. Yeah, I could have done without the false ending, but hey, it still led to some pretty intense moments. One of this year’s early surprises, I think. I think what got me the most was the ridiculous scene involving, let’s just say, some creative engineering. It was so preposterous. But it was also kind of funny in its own way. My main issues with this film consisted of two things. First of all it was not very scary, especially for a film that was touting itself as “the most terrifying film you will ever see” Gore is just gore, while it is sure to be gross, in and of itself it is not scary. My second issue had to do with the cast of the film. Where is the screen presence? the charisma? the it factor as an actor or actress that makes you care about a character was completely missing from this film. while I found this film mildy enjoyable it barely rose above mediocrity in my book. Yeah, I’m not sure why this movie marketed itself as the “most terrifying film you will ever see.” It didn’t do much for me in that regard, though it did scare the hell out of my girlfriend. The cast wasn’t memorable — there certainly wasn’t a Bruce Campbell — but I thought they were competent enough. Jane Levy is at least someone worth keeping an eye on. Hmmm, not sure if this one is going to be my cup of tea but this review and the recommendations of a few others have me wanting to at least give it a chance now. I was fan of the original (and the sequels) mainly due to the great screen presence and comic mannerisms of Bruce Campbell… that combined with the gnarly (if then silly and phony looking) effects were always a hoot. I may give this one a chance when it gets closer to Halloween time, as I normally wait until then to go on an all out horror fest. Good review. Thanks, Jules. Yeah this one is lacking a Bruce Campbell or anyone remotely as entertaining, but it makes up for it with amazing special effects and non-stop action. It’s quite the contrast from the original. I definitely want to see this one. Have been seeing a lot of good talk about it. It’s worth a look, as long as you don’t mind blood and gore. I have no problem with blood and gore, especially if you look at the good portion of the films that I have posted about. Will definitely check it out. Loved it! Great review! And I just voted for 8-bit. The NES will always be my fave console and have the best games. Thanks man! And yeah, I love the NES, too. I have so many fond memories of that system. Crazy movie…. Im sticking with the original. Fair enough. I think most will agree with you, though I think both are great on their own terms. Hi Eric, good review. I’ve written something a little more…less forgiving and more frustrated-sounding on my site. There were a few things I liked about it, but in trying to update it they had to include a hell of a lot of things that I just can’t stand about modern horror! Thanks! Yeah, this movie isn’t for everyone. People seem to either love it or hate it, but I had a blast with it. I couldn’t agree with you more. Evil Dead was surprisingly good because it didnt waste time around the horror and gave us plenty of scares and gore to last a lifetime. Im also not one that looks away, but I was very uncomfortable on more than one ocassion. The fact that is CGI free like you so justly pointed out does serve the film well because the makeup is exceptional enough to stand on its own. I gave it a 3/5, which considering the weak characterization is plenty generous. Well said! This movie was certainly intense, and way, way better than I expected. I think your assessment is fair, too, because you’re right — there really weren’t any enthralling characters.